NASA may not be sending anyone to Mars anytime soon, the exploration of space and beyond – though on a much smaller scale – is being spearheaded by folks like Richard Branson and Jeff Bezos. (Maybe you’ve heard of them.) Though Bezos and Blue Origin continue to work under a veil of secrecy in Texas, Virgin Galactic keeps humming along in the Mojave having recently scored a major milestone for the sub-orbital space tourism arm of Branson’s Virgin empire. Earlier this month Virgin Galactic and its partner Scaled Composites received an experimental launch permit from the Federal Aviation Administration, the first for a manned experimental aircraft. 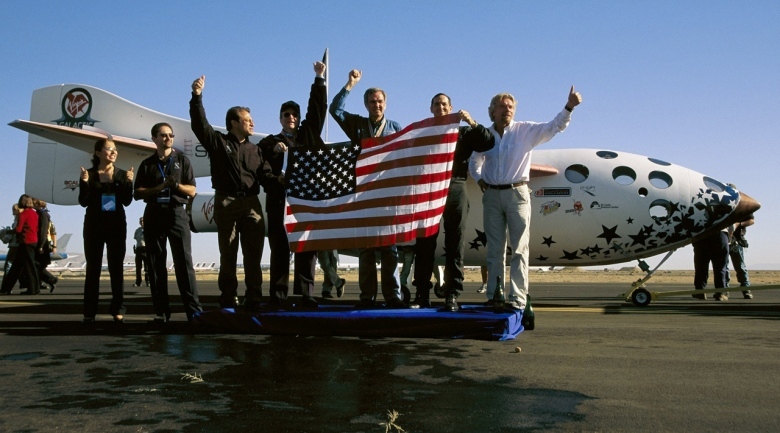 Considering there have been numerous test flights of both the mother ship (WhiteKnightTwo) and spacecraft (SpaceShipTwo) since 2009, I asked Virgin Galactic president and CEO George Whitesides what comes next. With over 500 passengers having thrown down a $20,000 deposit on the $200,000 flight into space, Whitesides says Galactic is “roughly on track” for a late 2013 commercial launch. Of those 500 plus passengers, Whitesides, the former Chief of Staff of NASA, and his wife will be aboard rubbing elbows with other notable passengers like Ashton Kutcher, Stephen Hawking and the dynamic Hollywood duo Brangelina. The Whitesides were two of the earliest customers having purchased tickets in 2005.